There is a crisis happening across the globe. This crisis is daily. It is embarrassing and is happening in public settings and within America’s shores. From the Atlantic to the Pacific, in grocery stores and shopping malls, this crisis can happen at any time of day. But be comforted America, for there is hope. We can change the course of our nation, but there are seven steps we must take in order to decrease the sheer magnitude of this daily crisis. The crisis is children under five-years-old turning into “werewolves” (see below for Freudian reference). In this post, my hope is to help readers tame your child’s inner werewolf and help your child function more like Michael J. Fox, the man, and not the werewolf version of him (see Teen Wolf) in private or public. Some readers may be asking, “Ryan, what is a tantrum?” To which you can stop reading because you are: 1) Not now nor have ever been a parent or 2) Should be writing this post instead of me and nothing you read will amaze you or be worth your time. If you don’t fit in one of these two categories, please continue reading. When your child reaches the majestic age of two or three (or four or five), your beautiful child will turn into a werewolf at certain moments. The textbook term for what I’m calling a “werewolf” is “temper tantrum.”If you've ever been blessed to live in Tennessee like myself, it's called a “hissy fit.”Say “hissy fit” out loud. Awesome, right?! Anyway, a tantrum is an emotional outburst, and is characterized by stubbornness, crying, screaming, yelling, shrieking, angry ranting, and often violence. The exact qualities of a werewolf, right? Sadly, this idea of children turning into werewolves isn’t original to me. In conducting research for this post, I was reminded by wikipedia (where else?!) that Sigmund Freud considered the Wolf Man in his research of tantrums, saying a subject became "discontented, irritable and violent, took offence on every possible occasion, and then flew into a rage and screamed like a savage.” This sounds true, therefore it must be true. I totally agree with Freud, if, in fact, Freud ever said this. Consider Your Source: If your child is five years of age or younger, remember that she is learning everything from using vocabulary to controlling emotions and understanding bodily functions. If nothing else, having this mindset will help you be more calm and understanding. Consider the Night Before: Did your child sleep well last night? If not, tantrums are more likely to occur. Make sure your child gets ample rest so he is not tired during the day. Being tired can lead to frustration causing him to act out in many ways. Consider Your Child's Diet: Did your child just eat a sugar-filled snack? If the answer is yes, head to the nearest outside park! Have you seen the Snickers “You’re not you when you’re hungry” campaign? Exactly. (“Party" is my favorite.) When your child is hungry, he or she will act differently; like a werewolf even. Moreover, when fueled with sugar, they will act like a large monkey in a small barrel; or a hungry Joe Pesci (see aforementioned "Party" video). Consider Getting Outside: Kids need to be up, out and active. They enjoy being outside and running around. 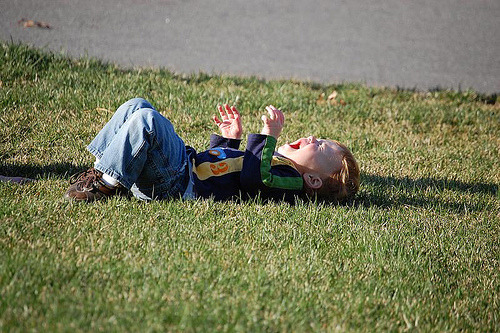 If your child is not getting outside at least 60 minutes per day for active play; you may be asking for tantrums. Consider Your Child's Vocabulary. Nothing frustrates a child more than not being able to say exactly what he or she is feeling or wanting. Talk to your child. Speak slowly when necessary, but always use careful and considerate words. As he grows, he will gain confidence and have skills necessary to say aloud what he wants or thinks. Consider 'Taking a Break': Actually say the words, “Take a break!” to your child. Say this in a pleasant manner and allow your child to “take a break” when you notice she is getting overly sensitive frustrated. Taking a break for your child may mean picking out a book and sitting alone in the bedroom for a few minutes until they calm down. The point is to not have them think they are in trouble or being punished simply because they are mad or frustrated. You as the parent or caregiver will know the difference between direct disobedience versus frustration or boredom. Sometimes, children simply need to be separated from their current environment. Consider Giving Choices: Sometimes, a simple "this or that" choice is the key to keeping tantrums under control. The point here is to allow your child to have options but with boundaries. This way, your child gets what is best and he also gets a sense of freedom in making decisions. What tips would you give for managing your child’s tantrums?